An Xbox Live Gold subscription will be required for more than just online gameplay and Netflix when the Xbox One drops later this year. According to a chart found on Xbox.com, the $60 (about £40, AU$89) per year subscription will be required to access the Xbox One's NFL, game DVR, Skype and OneGuide (a TV guide-like service) features. As on Xbox 360, a Gold subscription is also required for multiplayer gaming, Internet Explorer and "premium entertainment apps" on Xbox One. SmartMatch is listed there as well, though since the advanced matchmaking service is an online gameplay feature, a subscription requirement should have been expected. 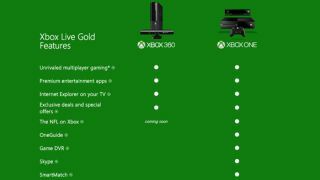 We asked Microsoft to confirm that these features will indeed require the Gold subscription, and a spokesperson for the company informed us that the chart is accurate. The subscription requirement for the NFL features may hurt the most, as avid sports fans who play video games casually may not want to shell out the extra cash for a subscription. The same goes for the TV features though, as casual Xbox One owners who don't play games online might have enjoyed using the console's interactive channel guide without the added cost. In fact, what about gamers who like to play solo or offline, but want to use the Xbox One's Game DVR features? Guess they're out of luck too. An Xbox Live subscription has more or less always been required to get the most out of Microsoft's consoles, but with PlayStation it's a different story. On PS3 online multiplayer and services like Netflix are free for all; a PlayStation Plus subscription gets players free games, discounts and other perks. That's changing on PlayStation 4, though, as the subscription will be required for most online multiplayer games on Sony's new console. The full feature sets that users will gain access to with paid subscriptions on each next-gen console has yet to be revealed, but we're expecting to keep learning more as their releases approach. Surprised about some of these Xbox One features? Here are ten you should know about.